I did quite a bit of pleasure readying last week, so I have four books to write about now. I’ll do full reviews for two book and quick review for the other two as they are follow on volumes to series I’ve been reading on an ongoing basis. First Impression: The cover makes it look like slice-of-life. I don’t like slice of life, but this is Vertical, so I bet this cover totally misrepresents the actual train wreck of a story inside. Whoa! What?! This isn’t a trainwreck?!!! It’s actually a nice slice-of-life story with sci-fi elements. I really like this! Artwork — A: It’s nice and simple. The facial expressions are telling, the characters look distinct, the characters actually look their age, and backgrounds are nicely detailed. 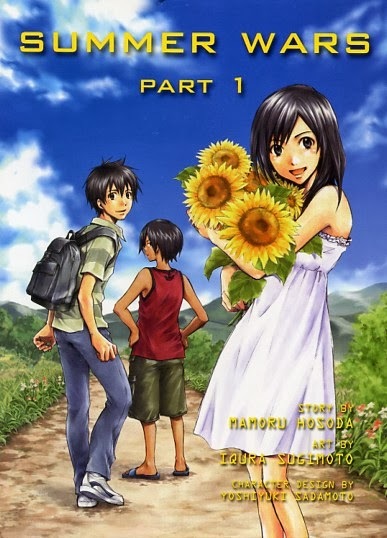 The color pages are really pretty (it helps that I love sunflowers). Presentation — B+: I love the front and back covers. They are very telling of the story — this is a slice-of-life story with sci-fi elements. The color pages are gorgeous and the translation reads smoothly. The drawback is the lettering. It looks amateurish. I don’t like manga with cased fonts used for the main dialog. On top of that, the line spacing is too wide on some pages. I think the inconsistency of line spacing is what bothered me the most. Story — B+: This is a typical loser-boy pursues a girl who he thinks is out of his league shounen story. The main character is a loser even though his math skills are second in the nation, and the girl is just pretty and popular. What’s best about the story in this part is the interaction of the main character, Kenji, and his love interest’s grandmother. The grandmother is the star of this part, and I wish there was some back story about her. The sci-fi elements involve computer hacking in a virtual world. I just accepted the representation of the mechanics of this world because if it were realistically represented, it would be boring. Anyhow, on the whole the pacing is good and Kenji and Wabisuke’s interaction with the grandmother are quite interesting. Overall — B+: This is a pleasant read with enough mystery to keep the reader wanting more. 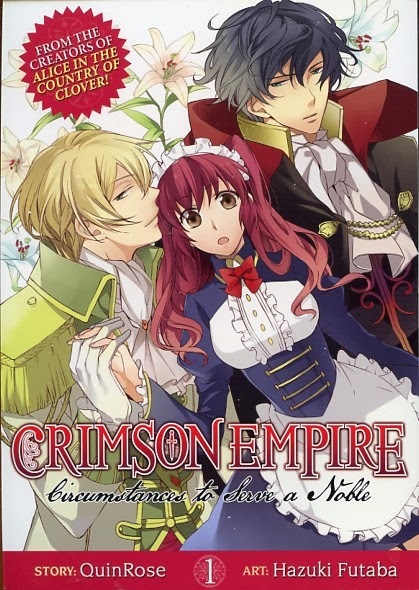 I highly recommend this title to Crimson Flower readers. Artwork — B: It’s typical looking artwork for Quinrose stories. There’s a lot of focus on faces and very sparse backgrounds. I like how the main character, Sheila, looks like a grown woman. I’m not sure what it is, but the artwork doesn’t wow me. I was expecting something more lush, perhaps? Presentation — B: I like the larger size format. The translation reads smoothly, though the modern slang and the general modern way of speaking don’t match the story. The sound effects are a mix of English and Japanese subtitled in English. Again, I think a professional authorized translations should go with one style of sound effects. There are nice color pages at the front of the book. Story — C: As far as I can tell, there is no story. I enjoyed the beginning the most as Sheila undergoes assassin training. Personally, I would have liked the entire volume to be devoted to her back story. I felt this story had a very promising premise, but the author was too scared to let it be as brutal and emotional as it deserved. It lacked the smarts of a series like “Black Butler”. Toward the end, a bunch of pretty male characters are introduced. I couldn’t keep up with them and eventually started not caring. Overall C: This first volume of this series was thoroughly mediocre. I’m going to get the second volume, though, in the hopes that a story will present itself. The premise has so much possibility that it’s hard for me to believe the author wouldn’t do anything with it. 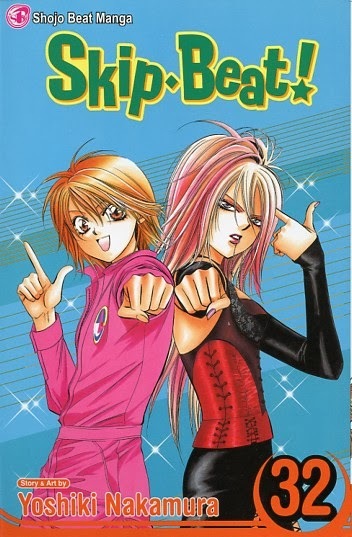 Quick Review — A: Kyoko and Ren as the Heel siblings are red hot! The tension runs high in this chapter as Kyoko deals with Sho and Ren’s jealousy. There’s a nasty cliffhanger at the end that caused me to buy volume 33 in Japanese. Quick Review — A-: The artwork is as lush and gorgeous as the first volume. It really is a treat to look at. This time the story revolves around Shuusei and Hotsuma’s relationship. 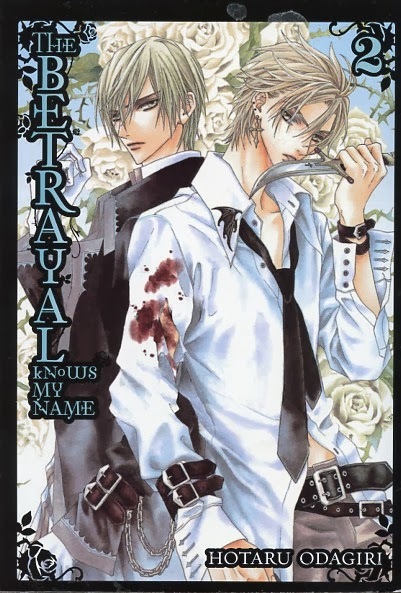 This is a lovely bromance and I enjoyed their story, although at times the narrative became very repetitive. We also learn Reiga’s true identity, which shakes Yuki’s faith. A new pair of Zweit are introduced at the end and I’m looking forward to their story in Omnibus Volume 3. Also, there are plenty of lovely color pages included in this compilations. It’s really nice!